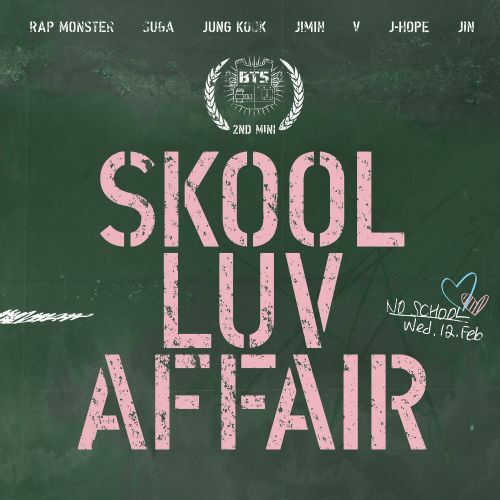 The Kpop Jungle: BTS' "Skool Luv Affair"
This is, I realized, the first mini album review on this blog! I hadn't even noticed that all of my previous reviews were of full length albums, it just happened that those were the ones released at the time. On the other hand though, I'm not sure if you can call BTS' newest Skool Luv Affair a mini album, because there are a total of 10 tracks on there. I wonder how long their actual first album will be if this is the shorter edition. BTS is marketed as a hip hop group, and considering they have 3 former underground rappers, it's a lot more believable than other groups having the same brand. Their music so far have had a more old school hip hop sound with hard hitting beats, meaningful lyrics and lots of great rapping. Compared to other hip hop marketed groups such as BAP, their sound is a lot lighter and I would say focuses even more on the rapping parts rather than the singing. I really enjoyed their latest mini O!RUL8,2? (that name though), and I'm not even a big hip hop fan. Also, these boys are hysterical and have great group dynamics, as seen on their channel BangtanTV, and I suppose it makes sense considering their long training period. Starting off the album is the intro Skool Luv Affair. It starts on a familiar note, having the same instrumental as the outro on the previous album, but instead of singing, Suga starts rapping about this girl he is in love with. The lyrics are sweet and full of love, but he gets interrupted by J-Hope, saying that "Hyung, this isn't it. Let me show you my style" and so the music changes. J-Hope raps his own way until he also gets cut off, this time by Rap Monster who claims that "this isn't BTS' style" and the music changes again. This intro is quite nice, because it introduces to to general sound of the group and the three rappers, as well as the theme of the album; love. Boy In Luv, the title track, continues on with the same powerful and aggressive sound that Rap Monster left off with in the intro. It's Korean title is "Real Man" which is supposedly what the song is about, a teenage boy wanting to be a man and confess to the girl he likes. He is becoming childish, immature and a bit frustrated at the fact that she's not giving into him and he gets mad at her for "teasing" him. In reality, he's not very manly or grown up at all, he's really nervous and insecure, wondering what he does wrong and what he should do. The style of the song is on the rockier side of the spectrum, and it mashes well with the rapping and husky singing. It has a nice melody and has just the right amount of banging guitars, and the build-up during the bridge is wonderful if you listen to it closely. I recommend listening to it without the accompanying video, because it draws away too much of your focus to their pretty faces (not that it's a bad thing, though). Next up the skit Soulmate which I have not yet found a translation to, but if I find one in the future I will come back and edit this. However, I don't really count this as a song to be evaluated for the final score, because it's not a song. It is, like the title suggests, a skit. The boys talk, laugh, scream and make funny noises at each other, which I presume is wonderful for native Korean speakers, but not for me. I like their voices though. Where Did You Come From is another satoori rap piece with some soulful singing in between. I personally love listening to satoori, even though I can't always identify it, because it sounds very playful and sometimes very strange too. This track allows J-Hope and Suga to shine, coming from Daegu and Gwangju respectively, and the other boys fill in here and there. The song is very laid back and cool, flowing smoothly and keeping its charming composure all throughout. The next song is Just One Day, another love song that's really romantic and sweet, but also a bit sad. The boys talk about wanting to be with this special girl for just one day, where they get to be together, hold hands, go out to eat and watch movies. I take this song as them reflecting on their lost loves, maybe those who they cannot see or be with because of them being idols. Part of reason I think so are the lyrics "If I have time in between my tight schedules" and "I know, I neglected you because of my dream", and it's harsh but it's true. That's what it's like being idols, unfortunately. Tomorrow sounds a bit different than the previous tracks. It has a deep, hard hitting beat and runs a bit more slowly as it talks about the problems you face as a teenager. Apparently, Suga wrote this song many years ago when he was a trainee, and I think it's a very meaningful piece he has composed. The lyrics speak to an entire generation of people, the teenagers attending school everyday, and it talks about the hopelessness and resentment you feel not knowing what you're doing with your life. You're doing the same things day in and day out, hoping that tomorrow will be better, but then tomorrow becomes today and today becomes yesterday. That feeling of being stuck in a system you can't control, having no power over your dreams or your future is a problem many can identify with. In Cypher Pt.2: Triptych, disses fly all over the place as Rap Monster, Suga and J-Hope unleash their aggregations. As someone who has followed the group over the past months you know exactly who this rap is for, and why. A while ago the boys were invited to a hip hop broadcast in which some underground rappers also were present, and rapper B-Free apparently talked down to them for being idols. I'm not going into detail and neither am I taking sides, but this caused a lot of discussion about rapping and hip hop in idol groups. You can make the assumption that this track is dedicated towards those who claims they're less capable as rappers or more musically restricted just because they happen to be in an idol group. There are a few good lines in here, my favorites being "I'll chew you and swallow, you're bubblegum" and "If I'm the sun, you're the moon, because when I rise, you go down", because man that burns! Spinebreaker is another song whose lyrics really make it stand out. Another song directed towards students, it talks about the pressure of fitting in and wearing the same shoes or clothes as everyone else, in order to not become an outcast. Teenagers nag their parents to get them the newest stuff without putting much thought in it; they "break" their parents' spines by always wanting more and more. It's very relatable, at least I know I've experienced what they discuss many times in my youth and still do to this day. We are so obsessed with status and the items that will give us a higher one, so much that it makes us greedy and selfish, and BTS talks about it in such an honest way. Part of being a teenager is slowly but unavoidably becoming an adult, no matter how much you want time to stop. Jump reflects on childhood years, the joy and innocence and now letting go of that as you grow up. However, it also says that you can still be that hero you dreamed of as a child, you can still follow your dreams and go your own way. All you have to do is jump, spread your wings and fly. The album ends with Propose, bringing the school love theme to an end. It's shorter and a lot sweeter and happier than the previous tracks. However, the musical pattern is the same so it still fits really well although there is a change in tone and mood. It's about a school crush, which is just perfect and is what the whole album takes its title from. What a mini huh? I found myself having genuine interest in these songs, and while most of them are quite simple from a musical standpoint, they are easy on the ears and make for a nice listening. What I love about this group is the involvement of the members, especially the rappers, who are credited more or less on every song on this record. That's not something you see everyday. I also enjoy the lyrics a lot, and I know I'm not the only one because they are very honest, identifiable, and home-hitting. Teenagers and students can most definitely recognize the different issues and feelings, whether it'd be love, frustration or greed. That, in my opinion, makes BTS stand out above other rookie groups, and I look forward to even more material from them.